For all of us who wish we were more adventurous in travel and in love, R.J. Fox is the perfect guide to Ukraine and the heart. Love & Vodka is funny, moving, and full of surprises. Love & Vodka is an old-fashioned love story told with uncommon wit and unabashed warmth. R.J. Fox guides his readers through the dangers of cold showers, straight liquor, and unfamiliar customs, to sweet new romance under gentle Ukrainian rain. A witty, engaging story of introspection, taking chances, and one American’s journey into Ukraine, a land that needs understanding now more than ever. Imagine a world where people think, act, and respond differently to the way you’ve always known—and then let R.J. Fox take you there. Not enough has been written about everyday life in the former Soviet Union, and it’s captured beautifully here. An utterly charming romp of a novel, rich with humor and culture shock—and at its heart, a solid gold love story. Don’t miss it! 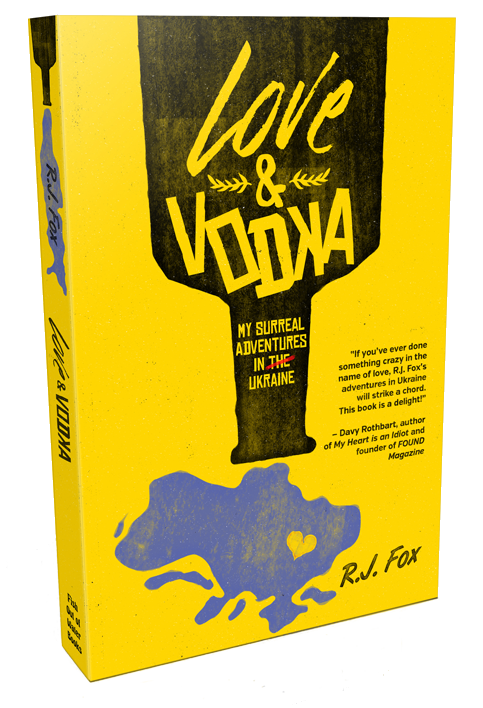 Love & Vodka is a warm, funny tale of an American who follows his heart to Ukraine. There he discovers a world where men are meant to be strong, drink copious amounts of vodka and resuscitate cars seemingly beyond repair. Will he or won’t he win his girl? Read on to find out in this zany tour of Ukraine through the eyes of a young Michigander. Love & Vodka is an easy ride to this foreign land. The kind of travelogue you want to take to bed or the beach or the metro … one to be read when you have the time to truly savor a travel experience. It’s a blend of love story, light history lessons and a close look at Ukraine through the eyes of a young, American man. Sharply observed and wickedly funny. When romance goes Ukrainian!